Developments come fast whenever and wherever they are needed to successfully prosecute the war. So the Kraft Cheese Company is going to enlarge the local plant and install a receiving plant in Carrollton. Both will have distinct advances to the milk producer. Todd Eugene Beck, 1959, contempt of court, continued to May 17 for review. Paul G. Nation, 1975, first-degree possession of a controlled substance, pleaded not guilty, appointed public attorney, preliminary hearing set for March 29. James D. Smith, 1977, first-degree narcotics, drug paraphernalia, preliminary hearing set for March 29. Kelvin Smith, 1961, first-degree narcotics, first-degree possession of a controlled substance, drug paraphernalia, appointed public attorney, continued to March 29. Rachel Lee Marcum, 1978, first-degree possession of a controlled substance, drug paraphernalia, appointed public attorney, preliminary hearing set for March 22. James D. Smith, 1977, first-degree narcotics, drug paraphernalia, appointed public attorney, preliminary hearing set for March 22. Joshua Earl Solomon, 1981, fugitive, waive to Indiana. Joshua Earle Solomon, 1981, public intoxication controlled substance, contempt of court, stipulated probable cause, dismissed. Vincent and Arlene Yager would like to announce the birth of Emily Lynn Marie Yager. Emily was born at 5:35 a.m., Feb. 1, 2019, weighing 7 pounds and 12.9 ounces. She was 19 inches long. She was welcomed home by her big sister, Casey Grace. Maternal grandparents are Larry and Anna Hawkins of Owenton. Maternal great-grandparents are the late Lawrence and Kathleen Hawkins. Paternal grandparents are Vivian Yager of Owenton and the late Gary Jenkins. Paternal great-grandmother is Virginia Hensley of Carrollton. 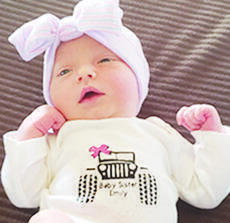 Proud parents Daniel and Katey Cobb Preston of Lawrenceburg are happy to announce the birth of their daughter, Emersyn Kate Preston. Emersyn was born Jan. 29, 2019, weighing 8 pounds and 7 ounces and was 20 inches long. She was welcomed home by her big brother, Dallas Preston. Maternal grandparents are David and Sherry Lyons and Danny Cobb of Owenton. Paternal grandparents are Shelley Sutherland and Steve Preston of Lawrenceburg. Paternal great-grandparents are Ray and Jean Caldwell of Frankfort. In the 1801 presidential election, both Thomas Jefferson and Aaron Burr received the same number of electoral votes. The election was thrown into the House of Representatives which chose Thomas Jefferson as the third president of the United States. That same year hundreds of thousands of people gathered at Cane Ridge, Ky., to participate in what would become known as the greatest revival in American history.